I have been using Yahoo Messenger (YM) often to chat with my older chat friends since my college days. 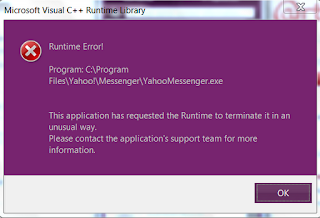 Since then it has been working fine but very recently I am getting an error message "Runtime Error" and Yahoo messenger stops working. This error message seems like a message from Microsoft Visual C++ Runtime Library tells about malfunctioning of the program. Once the alert is displayed, YM freeze and close by itself. If you haven't faced this situation yet, look at the alert provided below. way. Please contact the application's support team for more information. I took the screenshot of this message. While clicking the OK button, this application will be closed. I was using an older version of YM. So the first thing I did was to uninstall the current version, download and install a newer version. Anyway, I am not getting the same error now but when I search for the reason for this message, many tutorials say this is an error from the Yahoo's end (not with user computer). In Yahoo answers I found one user saying when he reset the Internet Explorer and disable the script debugging feature in IE, this issue was resolved. If I get the Runtime Error again I will definitely use his advice to disable script debugging in Internet Explorer and check for the issue. So the step by step troubleshooting is given below. Disable script debugging in Internet Explorer. To do this, click on the link below. I haven't tried the third set yet and I am not sure it will fix the issue. For me, this issue is fixed by uninstalling the current version from my PC fully and installing the latest release downloaded directly for their website. I believe the reason for this failure was the outdated YM software installed on my PC. If you are seeing this issue even after using the latest release, I recommend you to follow the third step provided in the solutions.